Now released into the mighty HOF 15mm Science Fiction range a new pack! 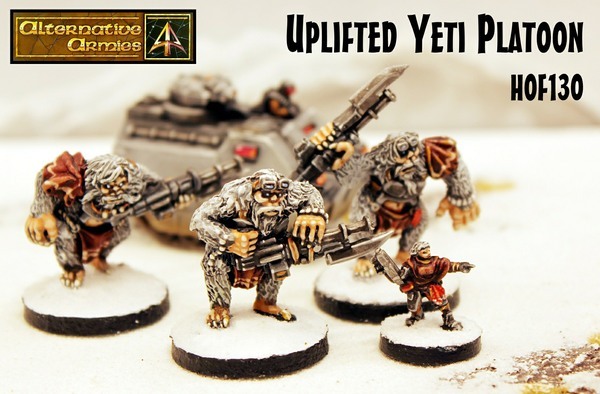 Uplifted Yeti's with Handler! Gene modded muscle these tribal fighters are used by Security Force Alpha where Battlesuits are ill prepared such as snowscapes and also where intimidation is needed on the colony worlds. Armed with big rotary cannons these are from the mind of Fred Richards. Following up on the BearCat Battlesuit and other packs such as Support Platforms, Bikes and Personalities these will fit into many campaigns. Our 15mm sci-fi release for January 2019. Details in the article. This entry was posted on Thursday, January 17th, 2019 at 20:01 and is filed under News. You can follow any responses to this entry through the RSS 2.0 feed. You can skip to the end and leave a response. Pinging is currently not allowed.